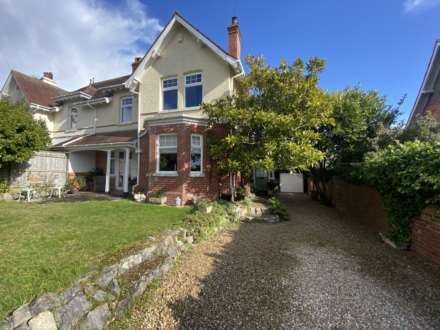 Located within walking distance to Budleigh Town Centre and handy for the local bus route, is this good size and well presented 2 bedroom basement flat located within this converted period property. This gas centrally heated and uPVC double glazed property comprises of an entrance hall, spacious living/dining room, kitchen/breakfast room, 2 bedrooms and a bathroom with a fitted white suite. Further benefits include a share of the freehold, a long lease term and an enclosed and easy to maintain rear courtyard garden. This property should be viewed internally to be fully appreciated. Dual aspect room with obscure glazed windows to both the side and the rear. Modern fitted white suite comprising of a large panelled bath that has a shower attachment above, shower curtain and rail and tiled splash backs to splash prone areas. Low level WC. Pedestal wash hand basin. Radiator. Extractor fan. A large room that has 2 x windows to the front. 2 x Radiators. Focal point of a painted stone fireplace with to one wall with a wooden mantle and displays above, The electric fire in situ is included within the sale price. Coved ceiling. Window to rear. Radiator. High level internal windows allowing for borrowed light to the hallway. 2 x Windows to side. Radiator. To the rear of the property is an enclosed and easy to maintain rear courtyard garden that belongs solely to Flat 1. Outside water tap. The property also has a right off way through the garden of Flat 3 to allow for rear access if required. The property benefits from a 1/3 share of the FREEHOLD. The property is held on a lease 999 from December 2000. 1/3 share of any maintenance on an "as and when basis". Building insurance contribution is approx £100 per annum. All main services are connected. Council Tax Band B. The property is on a water meter. Drive along West Hill Road heading towards Budleigh town centre. At the traffic lights, turn left into Station Road. Continue along this road, bearing right around the bend. The property will be found on the left hand side, on the corner of Clinton Terrace, with the front entrance door located on Clinton Terrace.